This week I put together a Mother’s Day gift for a young mother whose son was tragically killed a couple weeks ago. 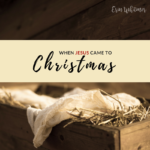 I went to three stores to try and curate the perfect gift, one which would offer a silver lining of hope, bright colors for that instant smile, and a hint of Scripture and God’s promises. But in the construct of this gift, I knew it would minister only for the briefest moment. I knew her smile would fade quickly. Because motherhood is messy when your child is no longer walking this hard earth with you. It was only two days after my son was released from the hospital after nearly dying that Mother’s Day came crashing in on my pity party. In the three weeks since he’d nearly died and our world had been flipped upside down, I’d known grief so brutal I wasn’t interested in breathing. And yet my son was still with me. Breathing. A life unfolded in front of him. But grief doesn’t discriminate. That first Mother’s Day I questioned why anyone would become a mother when it’s so full of hurt. I held my son and drank him in with gratitude, but motherhood had already broken me. 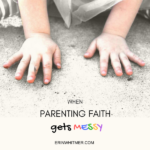 Motherhood is messy when it doesn’t look anything like the dream you once held so dear. Over the next couple years, as my one baby became two babies, and the days minutes multiplied, I struggled. 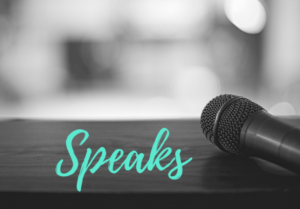 I had two boys just fourteen months apart and our days were filled with therapies, epilepsy and seizures, as well as a diet for my special needs son that stretched my sanity even on the best days. Oh but they were precious boys. They loved me and covered me with sticky kisses and crusted boogers. But I was too tired to notice and often too worn out to care. 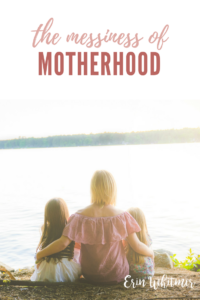 Motherhood was no longer heartbreak territory. It was a clashing of the wills, wild tempers, and screams through full-throttle lungs. And don’t even get me started on the boys. Motherhood is messy when you’re in the trenches with toddlers, and you know they’re God’s greatest gift in your life, but you just need a break. And maybe a mimosa. 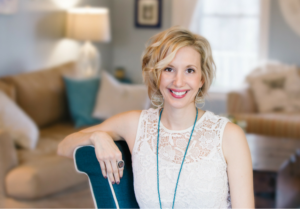 The other night, as my husband and I sat overlooking our back yard from the height of the boys’ tree house deck, we talked about the way motherhood has changed me. We could hear the boys’ voices off in the distance, and we’d just finishing speaking life over my 39-year-old belly, dreaming now of another baby coming into our world when God determines the time. I began to cry when I talked about how thankful I am to be a mother to my boys. Just as that thankfulness poured out of me like an offering, the younger mother in me cried out too. 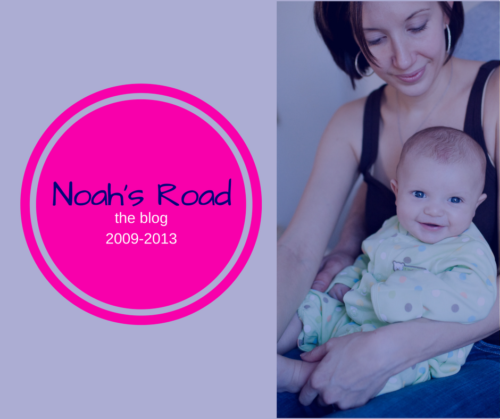 Because the first part of my motherhood journey was more heartache than hearty laughter. I wanted to run away just as much as I wanted to stay. I’d been tormented by fear and judgment and comparison and jealousy and what could have been and who I might have become and who I was and how I couldn’t measure up. My soundtrack of self-doubt and weariness played in the background as I tried to mother with a healing broken heart and two boys who only got along when ganging up on me. Oh my goodness, motherhood is messy. Us mothers have an impossible job. We are expected to carry life within us, birth it into this hard cruel world, and then set that life free. How can we live with our hearts running wild on the playground or darting in front of cars or screaming that they hate us? How can we live when the life we’ve brought into this world leaves us behind? How can we keep from falling off the tightrope we walk, balancing between the motherhood that gives and the motherhood that takes away? My sweet friends, motherhood is messy. If anyone knows how messy motherhood is, it was Mary, the mother of Jesus. Imagine disciplining the Messiah, the Savior of the world. Did Mary 1-2-3 Magic Jesus? I doubt it. In Luke, Chapter 2, as Mary held her month-old son, this perfect culmination of hopes and dreams, a prophet named Simeon told Mary that a sword would one day pierce her soul. We know now he meant she would watch her son be crucified. She would watch her son die. She would try to walk this earth without her son by her side. Yes, motherhood was messy even for the mother of the Messiah. Could Mary have ever fully understood her role as a mother? Early in her story, we’re told more than once that Mary “treasured up these things and pondered them in her heart.” Mary knew she was a part of something bigger than her, something that would transcend her flesh and her hurts. But she couldn’t quite figure it out. It was beyond her scope of understanding. Because God’s ways are higher than hers, just as they are higher than ours. But our role as mothers – no matter whether our children lie next to us or beyond us in heaven – is the most beautiful kind of messy. There’s divinity it in. Because God created these babies in our secret places. Friend, I don’t know what kind of messy motherhood you’re in. I don’t know whether you’re rolling over with laugher or doubled over in grief. I don’t know if you can’t catch your breath from chasing your children or if breathing feels unfair because your child’s breath is no longer on you. I don’t know if you’re living the dream or your dream is still waiting in the wings. All I know is motherhood is hard. And it’s messy. We will bloom within it, but it will cut us deep like a thorn. Still, there’s divinity in it. Because God’s in it with us. 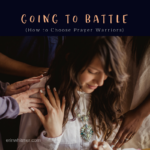 Friend, it’s time to ditch the chaos and give your faith a makeover. 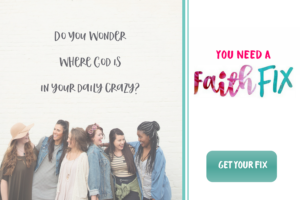 You need the 5-Day Faith Fix – five days of scripture, reflection and action designed to take your faith from faltering to flourishing.